He has been positive and, at times, protective in public comments about Flynn. "Wonderful" and "fine" are among the adjectives President Donald Trump has used to describe his former national security adviser, Michael Flynn. Trump has also defended Flynn as someone who "was just doing his job,” despite his asking for Flynn's resignation earlier this year. Trump's public comments about Flynn have been overwhelmingly positive, even sometimes protective. Just this morning, Trump said he feels "badly" for Flynn, who he said has "led a very strong life." 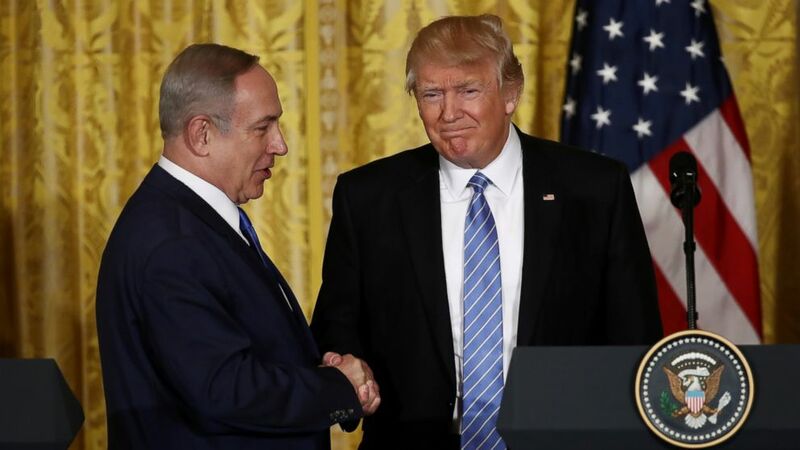 (Win McNamee/Getty Images) Israel Prime Minister Benjamin Netanyahu and President Donald Trump shake hands during a joint news conference at the East Room of the White House, Feb. 15, 2017, in Washington. "Michael Flynn, General Flynn is a wonderful man. I think he’s been treated very, very unfairly by the media -- as I call it, the fake media, in many cases. And I think it’s really a sad thing that he was treated so badly," Trump said. "I think it’s very, very unfair what’s happened to General Flynn, the way he was treated, and the documents and papers that were illegally -- I stress that -- illegally leaked. Very, very unfair," he said. 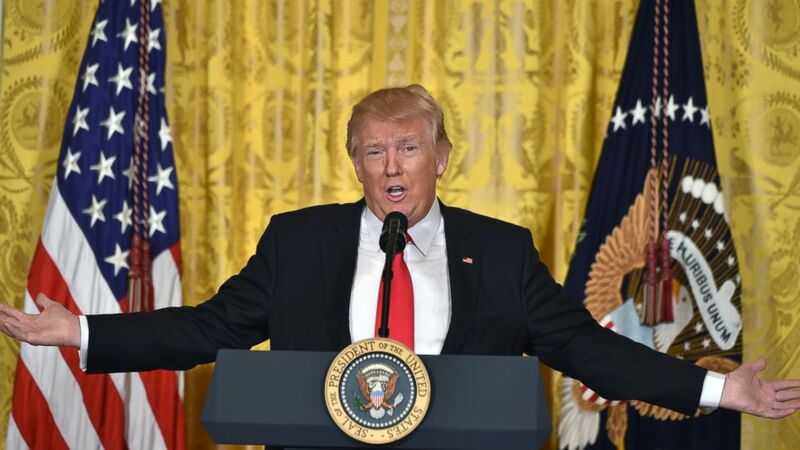 (Nicholas Kamm/AFP/Getty Images) President Donald Trump speaks during a press conference on Feb. 16, 2017, at the White House in Washington, D.C.
Trump was directly asked whether he fired Flynn. "Mike Flynn is a fine person, and I asked for his resignation. He respectfully gave it. He is a man who -- there was a certain amount of information given to Vice President Pence, who is with us today, and I was not happy with the way that information was given," Trump said. "The first thing I thought of when I heard about it [Flynn's call with the Russians during the transition] is, how does the press get this information that’s classified? How do they do it? You know why? Because it’s an illegal process, and the press should be ashamed of themselves. But, more importantly, the people that gave out the information to the press should be ashamed of themselves. Really ashamed," Trump said. When asked why he kept Pence "in the dark for almost two weeks" about Flynn's conversations with Russians, Trump said, "when I looked at the information, I said, ‘I don’t think he did anything wrong.’ If anything, he did something right. He was coming into office, he looked at the information. He said, huh, that’s fine, that’s what they’re supposed to do. They’re supposed to be -- and he didn’t just call Russia. He called and spoke to, both ways -- I think there were 30-some-odd countries. He’s doing the job." "He was just doing his job. The thing is he didn’t tell our Vice President properly, and then he said he didn’t remember. So either way, it wasn’t very satisfactory to me. And I have somebody that I think will be outstanding for the position, and that also helps, I think, in the making of my decision. But he didn’t tell the Vice President of the United States the facts, and then he didn’t remember. And that just wasn’t acceptable to me," Trump said. (Carlos Barria/Reuters, FILE) Former White House National Security Advisor Michael Flynn at the White House, Feb. 13, 2017. 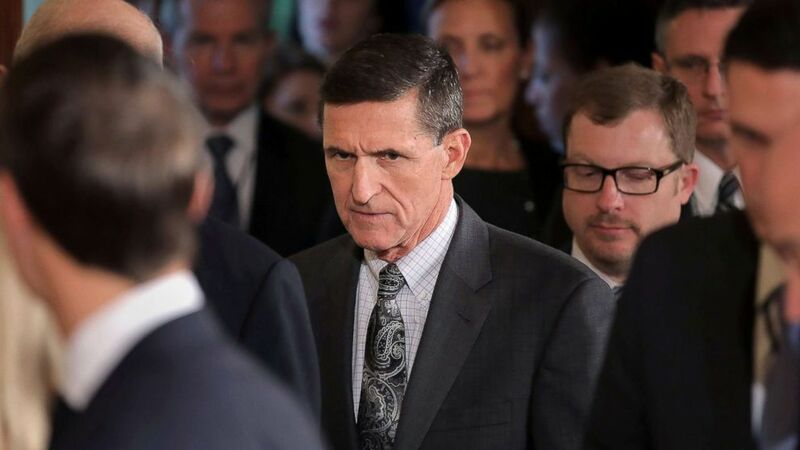 Asked again later whether he thought there was any wrongdoing in Flynn's calls, Trump reiterated that, "when I first heard about it, I said, ‘Huh, that doesn't sound wrong.’ My counsel came -- Don McGahn, White House Counsel -- and he told me.... He said, he doesn't think anything is wrong." Trump was also asked whether he directed Flynn to make the calls, and while he denies having done so, he said he would have no problem if he did. "I fired him because of what he said to Mike Pence, very simple. Mike [Flynn] was doing his job. He was calling countries and his counterparts. So it certainly would have been OK with me if he did it. I would have directed him to do it if I thought he wasn’t doing it. I didn’t direct him but I would have directed him because that’s his job," Trump said. The day after Flynn's lawyer released a statement asking for "assurances against unfair prosecution" if he were to testify in front of the Senate and House Russia investigations, Trump weighed in on Twitter. "Mike Flynn should ask for immunity in that this is a witch hunt (excuse for big election loss), by media & Dems, of historic proportion!" he wrote. Trump pointed to the Obama administration for giving Flynn security clearance in the first place. "I didn't realize this, when he went to Russia, it was 2015 and he was on the Obama clearance. When General Flynn came to us, as you now know, he already had the highest clearance you can have. I think the same clearance as the president of the United States would have. He had this really high clearance," Trump told CBS News’ John Dickerson. He reiterated that line of argument a week later. "General Flynn was given the highest security clearance by the Obama Administration - but the Fake News seldom likes talking about that," Trump wrote in a tweet. In an interview two days after firing FBI Director James Comey, Trump told NBC News’ Lester Holt that Flynn was "fired ... because of lying to the vice president." Trump was asked whether he knew that Flynn had received payments from the Russian and Turkish governments, and Trump said no, but suggested that "Obama perhaps knew" because Flynn's security clearance was granted during that administration. During an interview with The New York Times, Trump recounted a controversial comment he allegedly made to Comey before he was fired. "He [Comey] said I said 'hope' — 'I hope you can treat Flynn good” or something like that. I didn’t say anything," Trump told the paper. 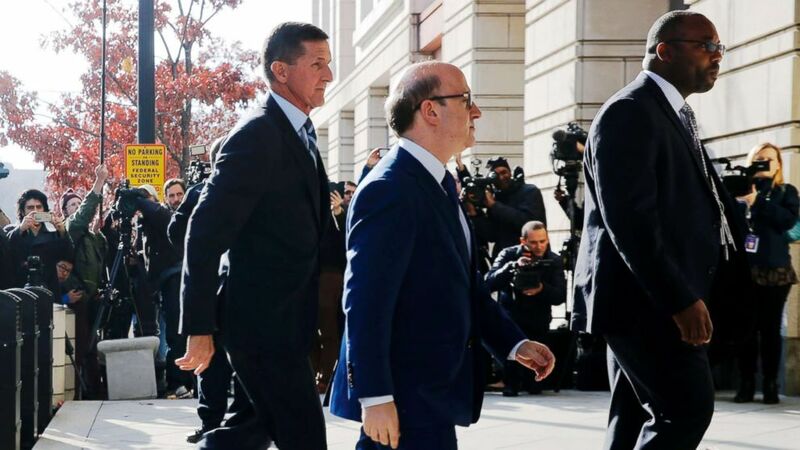 (Jonathan Ernst/Reuters) Former U.S. National Security Adviser Michael Flynn, left, with his attorney Robert Kelner, center, as he arrives for a plea hearing at U.S. District Court in Washington,D.C., Dec. 1, 2017. The day after Flynn entered a guilty plea for lying to the FBI, Trump was asked by a reporter whether he was concerned about what Flynn might tell special counsel Robert Mueller. "No, I'm not," Trump said. "What has been shown is no collusion, no collusion. There has been absolutely no collusion." "So we're very happy and, frankly, last night was one of the big nights," he added, apparently referring to the Senate's overnight passage of the GOP tax overhaul. Asked then whether he still stood behind Flynn, Trump said: "We'll see what happens." That same day, a tweet was shared on Trump's account that his personal lawyer John Dowd said he wrote. The tweet read that Trump "had to fire General Flynn because he lied to the Vice President and the FBI" which would suggest that Trump knew Flynn had lied to the FBI when he had asked Comey to "treat Flynn good." He posted another tweet wherein Trump wrote that "Flynn lies to the FBI and his life is destroyed, while Crooked Hillary Clinton, on that now famous FBI holiday “interrogation” with no swearing in and no recording, lies many times...and nothing happens to her? Rigged system, or just a double standard?" "I never asked Comey to stop investigating Flynn. Just more Fake News covering another Comey lie!" Trump wrote on Twitter. President Donald Trump today again addressed the guilty plea by his former national security adviser, Michael Flynn, saying he feels "badly" for him. "Well, I feel badly for General Flynn. I feel very badly. He's led a very strong life. I feel very badly," Trump said when reporters asked about Flynn on the White House South Lawn. He also compared Flynn to Hillary Clinton, saying Flynn is receiving far worse treatment for what Trump described as similar actions by Clinton. "I will say this, Hillary Clinton lied many times to the FBI. Nothing happened to her. Flynn lied, and they destroyed his life," Trump said.